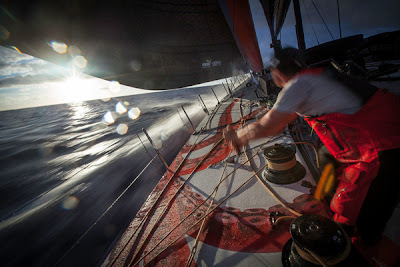 At 1900 GMT tonight, Volvo Ocean Race Leg 6 leader, Ken Read and PUMA Ocean Racing powered by BERG were under attack from CAMPER with Emirates Team New Zealand (Chris Nicholson/AUS), backed up by Telefónica and Iker Martínez/ESP, as they struggled in light air. 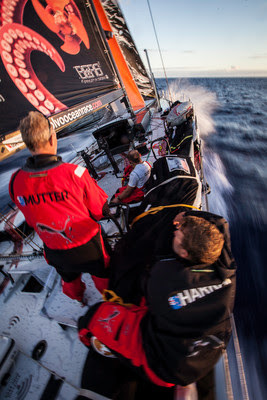 CAMPER had closed to within nine nautical miles (nm), and Telefónica was a whisker over 11 nm astern, gaining an impressive 14 nm in the previous three hours as did Abu Dhabi Ocean Racing (Ian Walker/GBR), who are also in touch and only 23.2 nm behind PUMA. Much further back and now over 105 nm in deficit, the French on board Groupama 4 (Franck Cammas/FRA) had made a small gain of three miles, but were at least moving at around 8.3 knots, while PUMA and CAMPER were barely making six knots as the fleet compressed on their tail. However, Ken Read and his men are confident. 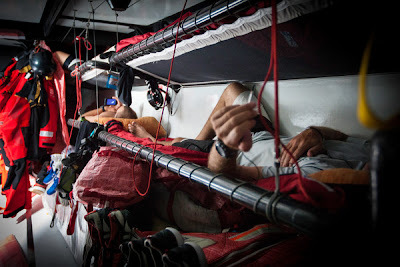 “Relaxed tension,” is how skipper he described the mood on board PUMA, saying his team have been sailing better since after Leg 3. “It’s much more relaxed onboard. You don’t want to have nervous energy when you’re at, or near, the front. 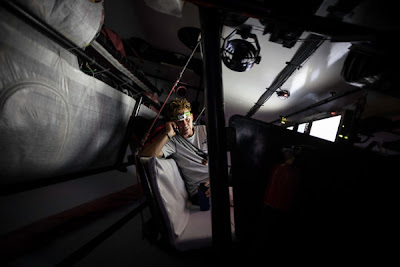 There’s certainly more of an air of confidence on the boat,” he said. Telefónica navigator, Andrew Cape said much the same. “The race is long. There may still be a drag race, which we’re pretty good at, and we’re confident. In those sorts of conditions, we’re pretty good,” he said. Until the last three hours when things slowed down considerably, today has been stable sailing on one tack in constant breeze under a sunny sky and the fleet should reach Recife on Saturday morning.